UConn ScHOLA²RS House is a scholastic initiative to groom, nurture, and train the next generation of leaders to address grand challenges in society through the promotion of academic success in undergraduate programs at the University of Connecticut and in competitive graduate programs. 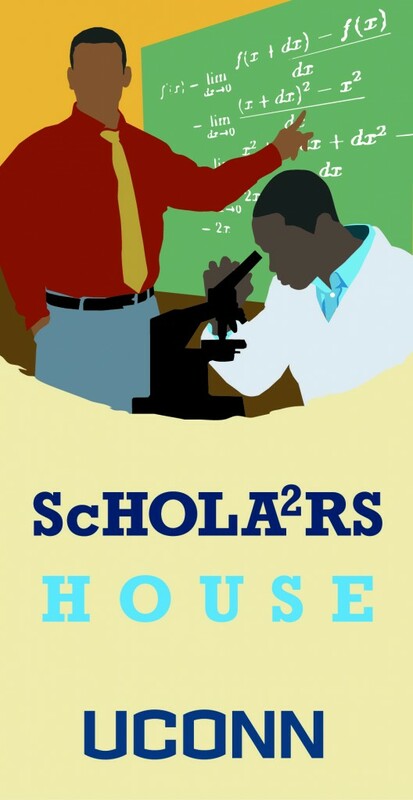 ScHOLA²RS House is a Learning Community designed to support the scholastic efforts of male students who identify as African American/Black through academic and social/emotional support, access to research opportunities, and professional development. The intent of this Learning Community is to increase the retention and persistence of students using educational and social experiences to enhance their academic success at UConn and beyond in graduate and professional school placement. ScHOLA²RS House will encourage involvement with the larger university community to foster peer and mentor relationships and will actively engage students in inclusion efforts at UConn. Dr. Erik Hines is an Assistant Professor in the UConn Neag School of Education Counseling program. His research centers around African American male academic achievement, career development, and college readiness; parental involvement and its impact on academic achievement for students of color; and improving and increasing postsecondary opportunities for first generation, low-income, and students of color (particularly for African American males). Additionally, he is interested in career exploration in the fields of science, technology, engineering, and mathematics (STEM) for students of color. His research has appeared in peer-reviewed journals such as The Journal of Counseling and Development, Professional School Counseling, and The High School Journal. The ScHOLA²RS House Living and Learning Community and the African American Alumni Council invite you to enjoy an evening with student scholars and fellow alumni on Sunday, February 10th in commemoration of Black History Month. The program will begin with an optional tour of Werth Tower which houses eight living and learning communities including ScHOLA2RS House followed by a panel discussion in the Alumni Center. The panel will be comprised of alumni from different eras who will discuss their experiences at UConn as well as solutions to navigating college and life successfully. The program will also include time for students and alumni to network. Please register below by February 4, 2019. 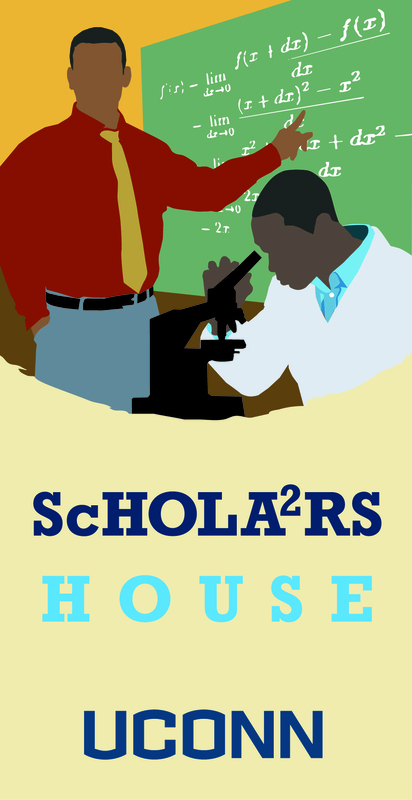 ScHOLA²RS House is one of over 30 Learning Community programs in which UConn students can choose to participate. Students who apply to participate in the ScHOLA²RS House program will live in the Peter J. Werth Residence Tower (Werth Tower), sharing a floor with Innovation House students. Werth Tower will house over 700 students participating in eight Learning Communities, providing ample opportunity to engage with students from across majors, interests, and backgrounds: EcoHouse, Engineering House, Eurotech House, H2O House (Honors to Opportunities), Innovation House, ScHOLA²RS House, Public Health House, and WiMSE House (Women in Math, Science & Engineering). Each Learning Community is led by a team, which can include a faculty director, graduate assistants, a residence hall director, student resident assistants, and student mentors. Students participating enroll in a one-credit Learning Community-themed FYE (First Year Experience) course or a one-credit sophomore course and engage in activities throughout the academic year. Living and Learning Communities are national proven high-impact practice that provide cohorts of students with opportunities to investigate areas of interest, either based on their major or an interdisciplinary topic, through guided courses and co-curricular activities. Living and Learning Communities develop knowledgeable, responsible, engaged citizens in a culture of inquiry within a learner-centered university. While assisting students with their transition to academic life, they offer a small college feel and a sense of place on a large campus; they promote meaningful and sustained interactions with faculty, staff, and student leaders; and they provide an effective structure for curricular coherence, deeper learning, student success, persistence, and engagement. Yes. Undergraduate students can apply to participate in any Learning Community for which they are eligible. If I apply to live in ScHOLA²RS House, will I be separated from the rest of campus? No. Typically, students do not spend their days in their residence hall. Students are in classes across campus, they participate in student organizations, they apply for leadership opportunities and work in offices across campus, they study in the library, they share meals in several dining halls, and so forth. A student’s Learning Community is simply a cohort of students with whom they engage in activities, such as they would if they joined another organization. It will not encompass a student’s entire college experience. What it will do is provide a group of faculty, staff and students who support each other and encourage the success of its members academically, professionally, and socially. Why are you developing a Learning Community that will examine the African American/Black male college experience? Nationally, as well as at the University of Connecticut, the retention and graduation rate of black males is significantly lower than that of other demographic groups. There are a number of factors contributing to these statistics. In response to the research on black male success in college, we have developed a grant-funded program to intentionally provide a supportive community of engagement for students using the successful Learning Community model which provides enrichment programs for undergraduate students on campus. A research study will be conducted to inform the higher education community about which factors influence the success of black males in college. There are also a number of students, faculty, and staff who have expressed an interest in supporting or collaborating with ScHOLA²RS House, and we welcome these requests. Who can apply to live in ScHOLA²RS House? Any male undergraduate student enrolled at the University of Connecticut, eligible for on-campus housing, and interested in engaging in topics related to the experience of black males in higher education is invited to apply.